The Pz.Kpfw. 38 (t) n.A. is a German tier 4 light tank. Essentially a Pz.Kpfw. 38 (t) with more armor, more hit points, and a higher top speed, but lower acceleration. The "nA" in the tank's name stands for neuer Art, which might be considered similar to the term "state-of-the-art" in English. 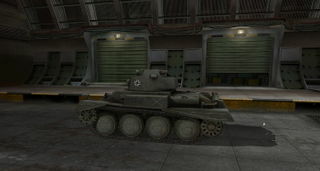 Its upgraded cannons are surprisingly powerful and are even able to damage a Tier VII tank in certain situations. However it is slow in reverse, making reversing an unreliable way to get out of a jam. The Pz.Kpfw. 38 (t) n.A. leads to the Pz.Kpfw. IV Ausf. H, and the Jagdpanzer 38(t) Hetzer. The Pz38nA is one of the most misunderstood and under-rated Scout tanks in the game. Most players cannot advance past its slow acceleration and poor traverse rate, thus it ends up being labeled a dog. It is far from that. It is fairly small and is blessed with the best View Range for Tier IV, making it an excellent Passive Scout. It can completely dominate same-tier fights and still contribute offensively in Tier VI matches if running premium ammo. As with most Scouts, your goal once the initial passive spotting phase is over should focus on flanking and sniping. 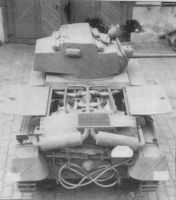 The 5 cm Kw.K. 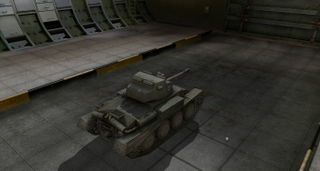 39 L/60 is required for researching into the Pz. IV Ausf. H but don't automatically mount it -- the 4.7cm gun has much better accuracy, 1 second shorter aim time, 600kg less weight(which matters for such a light vehicle) and much cheaper ammunition, only at the cost of 10 less damage per shot, a bit of penetration, and shell velocity. *The tank's actual weight was 11.8 tons. 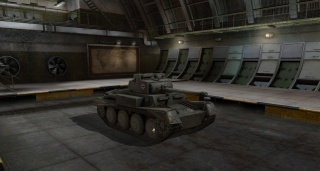 In World of Tanks, however, it weighs 10.86 tons (12.47 when upgraded). Its top speed is currently 64 km/h, but a test report from Kummersdorf indicated it reached 70 km/h. Both of its current engines have incorrect values. The two most historical engines for the vehicle would be the 220hp Tatra T-103 and 225hp Praga NRI (the latter's output was later increased to 248 horsepower by using twin carburetors). 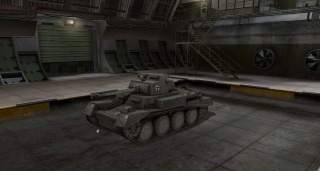 Its stock turret -- the Pz.Kpfw. 38 (t) Ausf. G -- was never developed for the PzKpfw 38(t) nA. Neither the 2cm Flak 38 nor 4.7cm Kw.K. 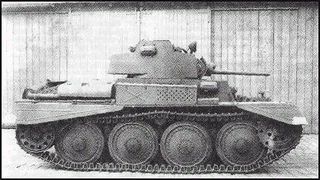 (t) L/43 gun were developed for the PzKpfw 38(t) nA. One of the Pzkpfw 38(t) nA's historical radios, the FuG 2, is missing. Neither the FuG 37 nor FuG 8 radio were developed for it. This page was last modified on 10 April 2019, at 11:02. This page has been accessed 294,814 times.